*However, we do ask for payments quarterly in advance. 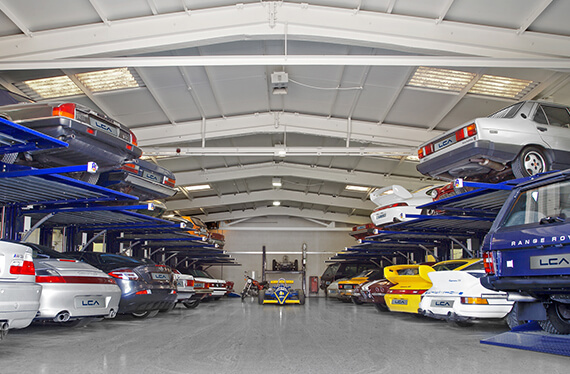 We provide car storage that is climatologically sealed & dehumidified to 50-55% relative humidity so that each car is stored and maintained within its optimum environment. We also use specialist ramp equipment so that we are able to create a two story high storage warehouse which enables us to hold twice the capacity of cars than any other storage facility of our size. • A Monthly Inspection: Checks for Fluid Leaks & Ensure all is working correctly. Engine run to operational temperature. This is to ensure your vehicle is kept in the best condition possible. If you have any questions don’t hesitate to contact us or find your answers in FAQs page. Please also see our Car Storage page. You are also able to take your car out any time you like (even on weekends!) with only 2 days prior notice. • Tyre pressures, engine fluid levels & battery checked. We can also offer an additional valet at a small charge to our induction process before storing your car. This includes a car wash, chamois dry, interior vacuum & glass cleaned. Please see our Pricing page for more information. Please also see our Car Storage Warehouse page.